blog.HalloweenAdventure.com | Latest News from the Costumes Trend FrontLines! : Biting Vampires! For years now, people have been all over Harry Potter. The irresistible boy who lived has captivated the hearts and souls of both children and adults. But Harry better look out! There’s a new children’s book series hot on his heels. HP, meet Twilight, a series of books about young vampires from author Stephanie Meyer. Meyer’s been crafting her tales in the hopes of reaching, just like Harry Potter did, both children and their parents, and everyone in between. This Halloween, channel the Twilight stars, now in the pages of their books, but soon to hit big screens in the Twilight movie, which is filming as we speak. 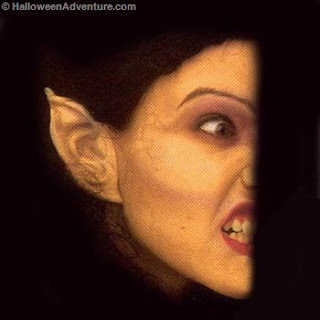 Those who want to go all out can channel the Twilight crew in our Classic Vampire Scary Horror Children’s Costume. This costume includes cape, vest with bow tie, medallion, cummerbund and gloves. Want to be the kind of vampire that nobody notices until you open your mouth? Try our fantastic Love Bites Deluxe Custom Fangs. Your prey won’t know what hit them until you open your mouth and it’s too late! These babies are so bad you don’t even need a costume to go with! Go the easy route with our Vampire Ears. These are, much like the Love Bites featured above, the perfect way to go if you want to mimic the Twilight Crew without too much effort. One of the best things about the Twilight stories is that the kids are vampires, but they’re also teenagers dealing with normal teen problems. You might feel compelled to try and hide your ears once you’ve got these on, but remember, if the Twilight kids can rock them, so can you! For a scary effect, pair the Love Bites with our Stage Blood. Stage Blood is a bright red water-based product that looks exactly like fresh spurting blood. Stage Blood dries just like real blood. Drip some blood down the side of your mouth, and you’ve got a realistic vampire effect. 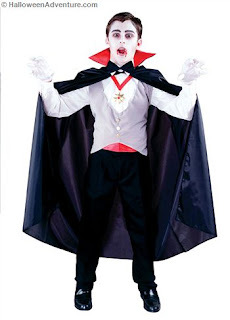 Other costume ideas include our Vampire Elite Collection Child’s Costume, a decadent outfit that includes velvet vest with attached shirt sleeves, dickie shirt front with scarf collar, full-length lined satin cape, pants and medallion on ribbon. Girls can try our Gothic Vampira Elite Collection Child Costume, a fabulous getup that includes a full-length lace-trimmed panne and shimmer satin gown, jeweled choker and tulle and lace petticoat. This costume is perfect for the heartbreaker, it’s bad and beautiful all at once. No matter which costume you choose, rock it vampire style! Be sure to get your hands on the Twilight and join the growing legion of fans!